After their harrowing escape from Mississippi, abolitionist Durksen Hurst, his fianc e Antoinette DuVallier, and their friends - a group of undocumented slaves - land in guerrilla-infested Civil War Missouri, the most savage whirlwind of destruction, cruelty, and death in American history. Trapped in a terrifying cycle of murder and revenge, scarred by Quantrill's cold-blooded Lawrence massacre and the Union army's ruthless Order Eleven, Durk and everyone he cares for soon find themselves entangled in a struggle for their very survival. 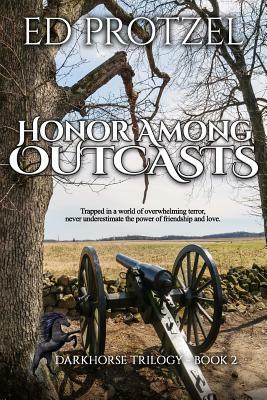 Honor Among Outcasts takes readers on a pulse-pounding journey of desperate men and women caught up in the merciless forces of hatred and fear that tear worlds apart, and the healing power of friendship to bring them together. What led to this unlikely and risky friendship? Read The Lies That Bind, Book 1 of Ed Protzel's DarkHorse Trilogy. Look for Book 3, Something in Madness, to follow.